Why should you learn to sell your products on Amazon? Everyone is looking for good nutritional supplements to keep them healthy; why shouldn’t they look to you? Selling your product on Amazon can not only bring you the business you want, it can bring the business you need to succeed. Vitakem can help you sell your supplements, from amino acids to vitamins, in an easy, efficient way that beats word-of-mouth and self-advertisement. Using Amazon for selling and drop shipping your products is the way to grow your business into something spectacular. Not only will you be able to sell to your customers in the U.S., but we’ll help you extend your reach overseas to the U.K. and Australia. We offer custom and professional in-house label design services; from complete creation to helping you use your own design, it’s all done here. We have over 200 private label stock products on hand for you to choose from; if you need it, we have it. Our order minimums are low; start off with just 72 bottles to begin your journey in vitamin and supplement sales. 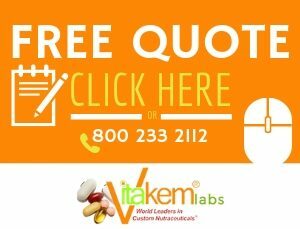 Vitakem supplements and vitamins meet all current Good Manufacturing Practices (GMPs) as required by the FDA. All of our labeling is FDA compliant. We offer the best in what people are looking for, from bodybuilding supplements to weight loss and more. An excellent way for a startup to learn how to make money by selling supplements starts on Amazon. Starting your own supplement company becomes much easier when you use Amazon’s drop ship program. Vitamins and supplements are in high demand at Amazon, so why not take advantage of all they have to offer? 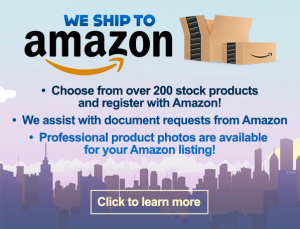 Using the low-cost Fulfillment By Amazon (FBA) program can help you make good use of the opportunity to take part in their shipping and warehouse program. There’s never been a better time to sell your private label vitamins and supplements on Amazon.com and with help from Vitakem, it’s never been easier to establish your presence. Selling can begin at your pace; as soon as you set up your account, if you prefer. Vitakem is a white label supplement company that provides you with the highest quality vitamin and mineral supplements available. We’ll help you create your own custom brand using our private label program and stock formulas. Our competitive prices and custom label design will help you get started quickly and efficiently, and by selling your goods through Amazon, you’ll save money and space, gain time and management, and provide a service that people are looking for worldwide. First: Get your product to Amazon. Amazon will need to have your product to sell it, so the first step is sending it to Amazon’s fulfillment centers. Upload your listing to Amazon’s system. Print the PDF product and shipment labels that Amazon provides. Ship your merchandise using Amazon discount shipping or your own carrier. Next: Amazon will receive and store your product. They will have the items cataloged as ready to ship inventory. Once your inventory is received, it is scanned by Amazon. Amazon records all of the items for storage. Inventory can be easily monitored by you using an integrated online tracking system. Then: Watch your orders grow. Customers will search Amazon’s pages for the supplements they need. Customers can also search other e-commerce channels, such as your own site. Your product will be available for Amazon Prime and it also can be ranked by price points. Global expansion is available if you desire. See your sales increase; FBA sellers reported unit sale increases of more than 20% after joining Amazon to ship and track their orders. Next: Amazon will pick your product from the inventory available, package it up, and ship it out. Amazon uses a high-speed picking and sorting system that locates products in the warehouse quickly. Your order volume is completely managed; whether you sell one bottle or hundreds. Your products can be combined with other FBA products that are ordered. Finally: Your products are shipped out to the customer by Amazon’s fulfillment centers, with full support. The buyer will choose the shipping method and Amazon abides. Shipping costs are all inclusive to your service fees. Tracking information for customers to watch their order’s progress is provided. Customers can contact customer service with questions if the orders were placed on Amzon.com. There’s never been a better time for you to reach out and expand your customer base and Vitakem can be the best expansion assistant you’ve ever had. Helping people is what we like to do, and not only will we be helping you to get your products selling on Amazon, we’ll be helping those who order the product by providing the highest-quality supplements available. Learn How To Start Selling Your Supplements With Vitakem And Amazon Today! Copyrights © 2017 Vitakem Nutraceutical Inc., All Rights Reserved Worldwide.